The rabbi leads a baseball clinic at Temple Emanuel on Oct. 30, 2015. With the first pitchers and catchers reporting for spring training in Arizona and Florida next week, sports fans’ thoughts turn to the national pastime. 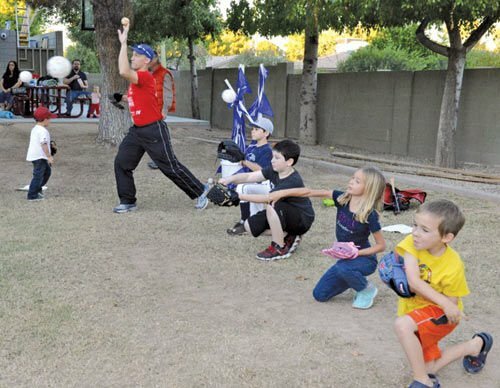 Rabbi Jason Bonder, who heads the religious school at Temple Emanuel of Tempe, has a particularly strong tie to the sport, having played in the single season of the Israel Baseball League back in 2007. He played Division 3 baseball for Muhlenberg College. He also double-majored in history and religion studies at the school in Allentown, Pennsylvania. While working at the school’s Hillel in his senior year, he learned of an opportunity to play professional ball in Israel. Larry Baras, a Boston-based entrepreneur, founded the small professional Israel Baseball League that summer with six teams – representing Modi’in, Petach Tikvah, Bet Shemesh, Ra’anana, Tel Aviv and Netanya – and a 40-game schedule. Two former Major Leaguers – Art Shamsky and Ken Holtzman – were among the team managers. He pitched for the Tel Aviv Lightning during the league’s sole season. He started a few games, but mostly served as a relief pitcher. He earned a 1-1 record and he recorded a save in the last game of the season. Then, he was ready to move on to his graduate work in Jewish studies at the Conservative Jewish Theological Seminary, which led to his rabbinical studies at the Reconstructionist Rabbinical College. He was ordained in June 2015. When he figured it out, baseball’s loss was the rabbinate’s gain. This article recasts an interview originally featured in the Temple Emanuel newsletter.